I’ve been thinking a lot about frogs lately. Not because I’ve seen or heard any actual frogs here in San Miguel de Allende, Mexico, but because I’m feeling a little like one. I’ll soon be moving into a new, safer, smaller place, closer to el centro; and I’m thinking of this new (to me) apartment as another in a series of lily pads. This silly thought is helping me to make the transition. As much as I love and admire trees, especially oak trees with their uprightness and deep-rootedness and unbudgable-ness, I’m not a tree. The reality is, I guess, I’m more like a frog, hopping along from lily pad to lily pad, on my way to the clear blue frog pond in the Great Beyond. Frogs, it turns out, have always held enormous meaning and symbolism, and not just to me now. “For countless centuries,” according to the website Exploratorium, frogs have lived “in the stories and myths of almost every human culture, taking on almost every role conceivable, from the trickster, to the devil, to the mother of the universe.” The ancient Romans thought that house frogs brought good luck. Both the Egyptians and Greeks believed frogs brought inspiration. Since frogs lay enormous numbers of eggs, it’s understandable that they’ve been seen as fertility symbols. 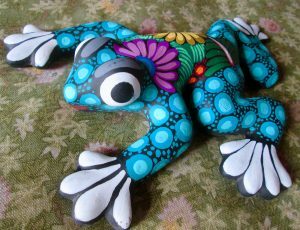 In addition to luck, inspiration, and fertility, frogs have also symbolized such things as rebirth, healing, transitions, opportunity, abundance and metamorphosis. When we were kids, I remember, we scooped up tadpoles (we called them “pollywogs”) from a pond in the woods and brought them home in glass jars (with holes in their lids) to observe their transformation from little, gilled, fishlike creatures to four-legged amphibians. Then we would carefully return them “to the wild” to live out their froggy lives in the murky pond. How, I wonder now, has it taken me so long to fully appreciate their better-than-butterfly metamorphoses? When I lived in Mali, West Africa, too I was astounded every year at the start of the short rainy season that my front porch would be covered in small, noisy, hopping frogs. Such abundance! Such a mystery! Where in the world had they come from, and where would they go when the long, hot, dry season returned? And here is a modern frog-fable I came across not so long ago, though I can’t remember where, about frogs in a stock pot: A whole lot of frogs were luxuriating in a huge stock pot on a stove, lolling about in the warm water as if at a holiday resort, not a care in the world. One frog, though, noticed that the water temperature was rising. He tried to sound the alarm, but he was shouted down. They called him a “party-pooper,” a “downer,” a “negative thinker,” a “depressive.” They told him, “Don’t worry! Be happy!” and “Chill, man!” Defiant – and perhaps foolhardy – the rebel frog hopped out of the stockpot into the unknown. Just in time, too. The rest were slowly cooked. Yesterday I bought a ceramic frog at the artisanal market here in San Miguel. 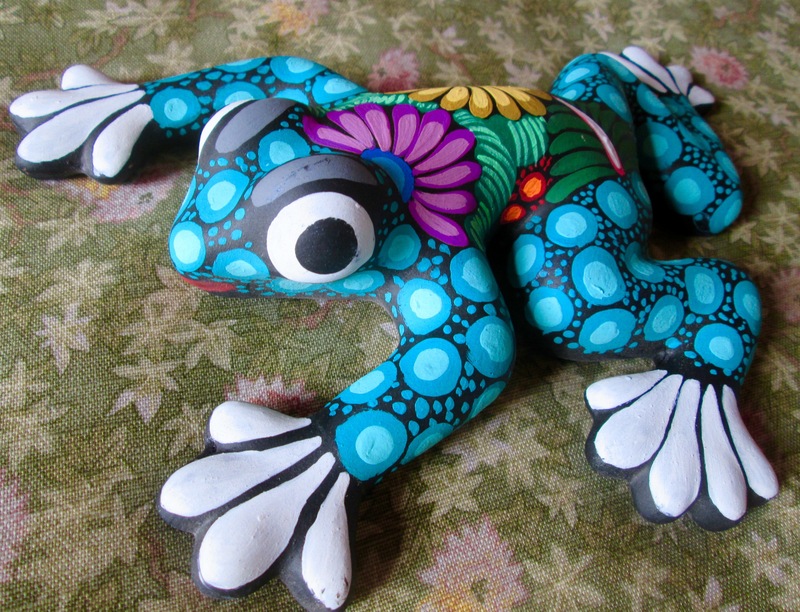 The salesman told me la rana (frog) symbolizes buena suerte (good luck). Oh, yes, I thought. This frog and I are going to a new lily pad.